Here's another picture with the whole body. The metallics are splendid. Is there a chance to see a tutorial about them in the near future? Would love that :). That skin colour is lovely ! Ok, when this ain't gonna be a 9.5 or higher on CMON...Metall is perfect in my opinion and the skin looks flawless too! I especially like the light on the sixpack-great job man! I'm gonna start a TM-Tutorial Petition. Great :). 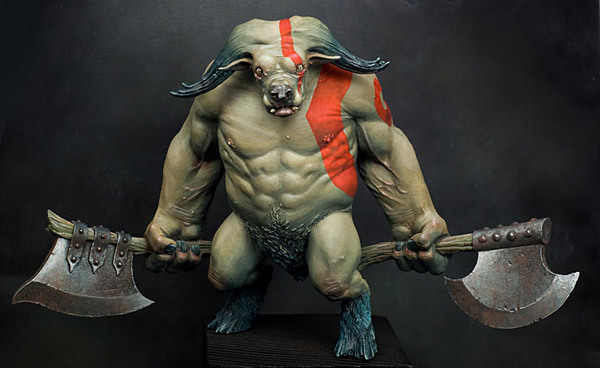 I`m not the greatest fan of the sculpt but your painting really rocks. Skin is fantastic and this fiery red tattoo is a pretty cool idea and it looks damn good. Thumbs up! 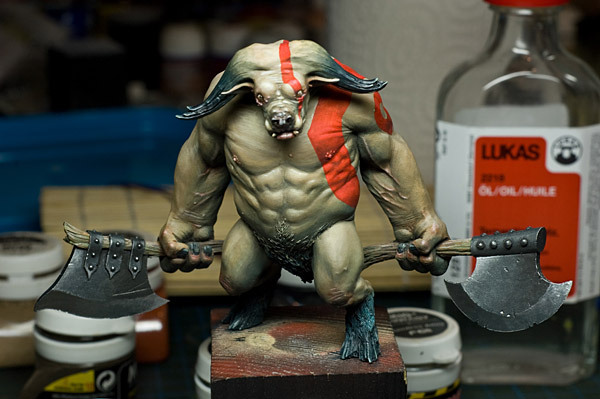 I love the sculpt itself and I love how you painted it!!! Even so far the best mini I've seen in a loooooooooooooooong time. Sorry for "little" necromancy, but i love this guys and i just have to ask for the skin recipe, after i saw this guy i just can't paint my beastmen in other scheme than this one :). I realise that it's been few years and u may not remember everything but any clue about colors would be awsome.